The Dream Shop is Done! Finally, after a year of work, my dream woodworking shop is finished. What was formerly an old, broken down, moldy, condemned building is new and beautiful again. All my tools are out of storage and ready to be put back to work and OH BOY do we have some fun projects on the docket! After 3 years building furniture by hand in our tiny laundry room in the house, I cannot express the pure joy of having space for pirouettes and machine “apprentices” in my woodshop. So many of my friends showed up in huge ways to help me with this project, and I couldn’t have done it without them. 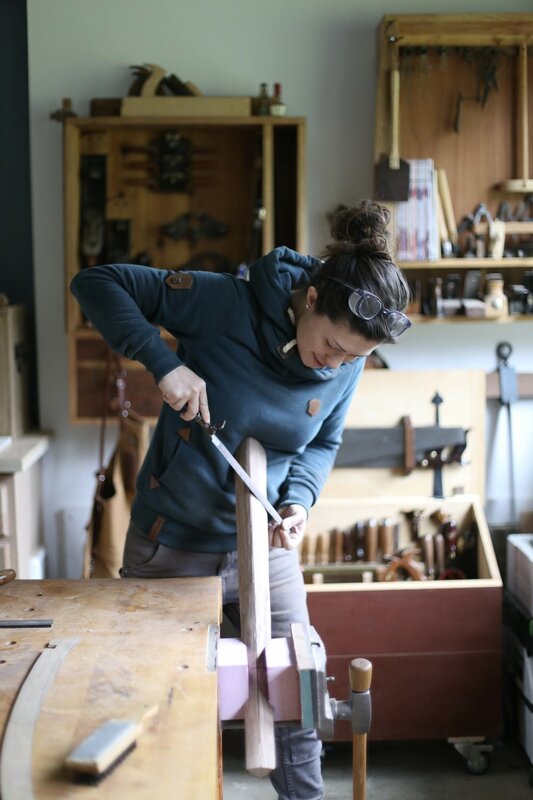 I love my new shop, of course, but what I love most is having a space that is warm and inviting, a space that inspires creativity, and a space where my friends and I can gather to build awesome stuff together. Posted on December 16, 2018 by Anne Briggs. This summer, my best friend April Wilkerson made two trips out to Seattle to help me build a Tiny House for my mom. Building a tiny house has been on my bucket list since we bought the farm, so it was SUPER AWESOME to finally get to tackle this project. During the process of this build, April taught me SO much about construction, and I must say, after all the remodeling I’ve been doing on the farm, it is SO MUCH more fun building fresh than trying to fix an old building. Everything happens so fast! As the tiny house sits currently, we have about 3 full weeks of work into it. It’s primed, roofed, dried in, drywall is up, windows, door and subfloor are in, it’s wired for electricity, buttttt the project is currently stalled as I’m waiting on some Solar Panels and a special piece for the roof so I can install the tiny woodstove, dry out the interior, and finish mudding and painting the drywall. At 8x16, this is definitely a TINY house, but once it’s all outfitted, it will be a really cozy, totally liveable space. I can’t wait to bring you the next portions of the build, so stay tuned! Posted on December 11, 2018 by Anne Briggs. This was a VERY long overdue project on the homestead, in which I tore down a wall separating our heavy use area in the barn and put in individual stalls and sliding doors for my miniature donkeys and Nigerian dwarf goats. I used all reclaimed lumber from a Parkour studio in Seattle which was torn down, and my neighbor donated the stall doors he was tearing out of his own barn to the cause. Between this project and the French Drain system I installed in front of the barn in October, the animals are far better set up going into winter this year than they ever have been before. With these upgrades, I’m hoping hoof rot, worms, and other minor illnesses resulting from staying damp all winter will be a thing of the past. These farm projects are of an enormous scale. They are hugely demanding both physically and financially, but it is a major goal of mine to give my animals the best life I possibly can. They unselfishly give me so much unconditional love and affection, and bring so much joy to our lives, I feel it’s the very least I can do. Posted on December 9, 2018 by Anne Briggs. This summer, I was honored to be invited to teach at the Port Townsend School of Woodworking. I taught a basic joinery class, in which we built a japanese style Tusk bookshelf. I had to build one to prepare for the class, so I decided to bring along a camera while I did. This is a great project to practice all kinds of woodworking joinery including hand cut dadoes, mortise and tenon, and, with a few simple design modifications, dovetails. Posted on December 8, 2018 by Anne Briggs. Making Cheese... and Dough... Pizza! Learn how to make cheese at home with just TWO ingredients, milk and cheese! One of my favorite things about homesteading is having fresh milk every day, but that milk adds up QUICK, and cheese is a great way to use up that milk, get some delicious fresh cheese, and enjoy a great byproduct as well, whey. This is my favorite recipe for cheese for Pizza, and to that end, I’ve included the recipe for my favorite pizza dough below as well. And, while we’re at it, my Pizza Oven video as well. Posted on December 7, 2018 by Anne Briggs. Posted on December 6, 2018 by Anne Briggs. After 4 years keeping bees, I’ve finally been able to harvest some honey! This is really “part 1” of the Honey Harvest video, because I’ll be making another video next week showing how to extract and process the honey with a centrifuge. I’m hoping to keep more hives at the farm next year, and am excited to have found a local mentor who will coach me a bit more in the process of keeping bees. Posted on December 5, 2018 by Anne Briggs. As some of you may know, I’ve been keeping our chicken flock in a lean-to off my woodshop for the past three years. It was meant to be a temporary solution, but three years suddenly went by, and they were still in there. My shop always smelled like chickens and my roosters made for quite the soundtrack in all my woodshop videos. I’m very happy to say the birds have an awesome new space of their own, which means another super awesome thing: The lean-to off my shop can now be turned into a blacksmithing shop! Some awesome benefits of this new Growing Back To Eden style chicken coop are that it’s very low maintenance cleaning-wise, and that the chickens now have an important “job” on the farm: Stirring our compost pile. A single bird can move several yards of compost per day, and if you know anything about composting, you know how important it is to keep the pile turning. Enter: chickens, and a whole lot less time spent with a pitchfork in my hand. The compost also generates heat, which will help the chickens throughout the winter. This is a fairly open coop design, and wouldn’t be ideal in a high predator population area, but thanks to our amazing flock watchdogs, the alpacas and donkeys, we haven’t lost a single bird to a predator in over two years. Check out the build videos below! Posted on December 4, 2018 by Anne Briggs.